Private transfer to and from Warnemuende. You are headed for a cruise or finishing it here in Germany and need a transfer to the port, hotel or airport? We can offer you comfortable, private transfers in airconditioned cars and vans. 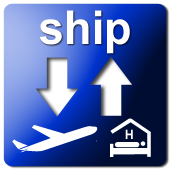 A transfer from Warnemuende to a hotel or the airport in Berlin takes approx. 2.5 hours, to Hamburg it is 2 hours travel distance. Our drivers will be awaiting you for the door-to-door transfer. Wherever you need to go, just let us know.